With 2015 already off to a quick start, each member of the AppAddict staff has taken a moment to reflect and select his or her picks for their top three apps of 2014. 2014 was a great year for iOS, with two new bigger and faster iPhone models and two new iPads. Not to mention a new OS, which may not have made as much of a visual impact as 2013’s update to iOS 7, but instead brought quite a few new features under the hood which we are surely to see the impact of in 2015. With so many new to choose from, it is always tough to narrow things down to just a handful of picks, but we’ll do our best below. Without further ado… here are the AppAddict.net Staff picks for their favorite Apps of 2014. Selecting my top 3 apps of the year was (as always) not an easy undertaking. Early in the year we got some excellent offerings like the often-imitated, but never duplicated puzzle game Threes!, Ravensburger’s perfectly executed jigsaw puzzle app, Ravensburger Puzzle and the out of nowhere surprise, smash_hit. Springtime brought us a wealth of creative, high-quality new mobile titles to choose from including Monument Valley, Hitman GO, FTL: Faster Than Light and the utterly brilliant Thomas Was Alone. Summer had its fair share of notable games as well with Inkle’s 80 Days adventure game, Tin Man Game’s superhero gamebook Appointment With F.E.A.R. Gameloft’s Modern Combat 5 and TheCodingMonkeys unexpected gem, Rules! leading the pack. In the Fall, BeaverTap Games proved that more Mikey was a very good thing, with the release of Mikey Boots and Ubisoft captivated us with their iOS port of Valiant Hearts: The Great War. Finally, even as much of our free time was taken up by the holidays, there were high quality mobile games like Kingdom Rush Origins, Highrise Heroes and the thought-provoking Papers, Please to play while trying to stay warm inside. It was a great year for iOS gaming, but one category of games in particular really caught my interest and my love for both physical and digital board games was really re-ignited last year and as such, all three of my top games fall into this category. This humorous little spaceship building / racing / adventure board game is absolutely brilliant. Players race to build spaceships out of a pile of junk and then compete with other players to collect and sell goods, avoid being boarded by enemy invaders, dodge meteors and more. A position previously held by Ticket To Ride, Czech Games Edition’s stellar digital implementation of Galaxy Trucker is quickly becoming my go to digital board game and the one that I reference as the gold standard for how digital board games should be made. With a detailed tutorial, extensive single-player campaign, as well as Pass & Play local multiplayer, online multiplayer (with loads of customizable game options) and a quick multiplayer game, there is an immense amount of replay here. I had only played the physical game once before trying this, now I am a big fan! If you had asked me about halfway through the year, what my top game of the year was, it would have definitely been Hearthstone. Instantly addictive, and polished nearly to the point of requiring sunglasses…one play of this digital-only deck-building/card battling game and you quickly see why Blizzard has received all of the buzz it has for this game. Easier to grasp than Magic, a free price-point for entry and no knowledge of the World of Warcraft universe required, the game is easily approachable by players of any level of experience. Blizzard has done a nice job of providing paid and free updates over the year and with an iPhone launch coming sometime later this year, I expect to be playing Hearthstone for a good long time to come. Finally my third game (which could have probably just have easily been my top game as well) is the digital implementation of the space-themed deckbuilding game Star Realms. Players start with a basic deck of cards consisting solely of the most common ‘Trade’ and ‘Combat’ cards and the goal is to reduce your opponent’s Authority (health) from 50 to zero by playing cards from your hand. On your turn you play your 5 hand cards and use the ‘combat’ points to buy more interesting cards from the center and the combat points to attack your opponent. It’s that simple. There are lots of interesting decisions to make on which cards to purchase to possibly create powerful combos, or just deprive your opponent, and when to cull your deck to improve your engine. You can never count you or your opponent out because a tuned deck can net you some devastating blows which can flip a game 180 degrees at any moment. Other than its ease of play, one aspect of Star Realms that really excited me is that unlike other deckbuilders where you are pretty much playing solitaire, with player interaction generally limited to forced discarding of cards or depriving the other player of the card they want, in Star Realmsyou are literally trying to destroy the other player. Outside of the cross-platform multiplayer (which you unlock through a single $4.99 IAP) there is also a fun single-player campaign. The physical version of the game just four mini expansions, so I’m hoping that these make their way to the digital release sometime later this year as well. If you want to challenge me to a match…my user ID is ‘Brett’. This app replaced my love affair with Mailbox, which is a fantastic app, but Google’s “bundling” of similar emails has made checking my email go from an anxiety-ridden hassle to simple swiping and forgetting. I check my email less than ever before and manage to be more on top of things than I ever thought possible. Easy, simple, and exactly what email should be. THE POKEMON COMPANY INTERNATIONAL, INC. This iPad-Only app is a port of the PC game where players can play the Pokemon Trading Card Game against other players. The best part is if you play the paper version of the TCG, you get a code in each pack for a digital pack for Pokemon TCG Online. The game plays nice with PC players so you don’t lose any progress when you log in to the iPad app and can play your friends 24/7. Totally worth your time if you even have a nostalgic interest in the game from years gone by. This digital-only card game made the perfect transition from PC to tablets and is simply a joy to play with a touchscreen. Games are reasonably quick, cards are full of gorgeous art and all the special effects remain intact from the PC game. Being able to use it to chat with your battle.net friends is also a nice little bonus if you are away from a proper computer. While the game isn’t a true “Trading” card game like Magic or Pokemon, in the fact you cannot trade cards with other players, it still features all the bells and whistles TCG players know and love, from the thrill of opening packs to get that epic or legendary card, to building a deck from your huge collection to beat that tricky opponent. Blizzard was smart to keep the costs of packs low, as well as allowing various ways of earning packs in-game, it keeps you playing and buying. This game is one of my most-played Steam games and it keeps calling my name from the Games folder on my iPad. A great Rogue-like space game that will frustrate you to no end feeling like the AI is out to get you, but is oh-so-satisfying when you escape a nasty pirate with your crew intact. Both are reasonably short games that will jump-scare the bejesus out of you, but keep you coming back for more. You spend 5 nights (at least) as a security guard in a fictional Chuck-E-Cheese’s type place where the robots roam freely at night and if they catch you….Suffice to say watch your power and keep your doors closed. If you haven’t read about these games, get out there and get educated. They have a cult-like following that very few games these days have. Another great deckbuilding game from the creators of Ascension.Star Realms offers fast paced PVP style gameplay that offers a surprisingly lengthy amount of totally free (and ad-free) gameplay, making the eventual $4.99 cross-device purchase totally worthwhile. This is a bit of a cheat, the app has been out for a while but with the inclusion of the WWE Network that launched in early 2014 the app has gone from collecting virtual spiderwebs in my iTunes library to the most frequently accessed app on my phone next to Google+/Hangouts. Then of course there are the live Pay-Per-Views, which my son and I now enjoy without having to deal with wondering if it is worth the $50-$60 to watch. Sadly the rest of the app is very underwhelming, and I don’t think I have spent much time with the other features, but as a Netflix-for-WWE, it does the job just fine. It’s that time of year again! The wonderful winter season when you push friends outside and lock the door behind them to see how long it takes for them to turn into snowmen! 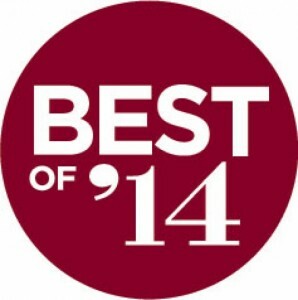 Also, it’s that time again to reflect on some of the best apps of last year! Winter means board games, and this board game for the modern gamer is a winner. Like I said in my review, it’s worth checking this one out just because of its highly unusual aesthetic. Taking the style of the Hitman games and morphing it into board game form provides an entertaining and memorable experience for players. It’s perfectly bite-sized for those who want a few challenges condensed into a few minutes time. I found myself, like many others, addicted to the frantic survival-driving gameplay of Zombie Highway 1. Just when I thought I could get away from this brilliantly fun app, along came its sequel to steal my heart (and brains [original zombie joke alert!]) all over again. Tightly updated with basically better everything, the fun of the first carries over into this game, and players will again find themselves once again trying to beat high scores and arm themselves with better weapons and vehicles. Yes, I know I’m cheating with this one since it came out well before last year (way before last year, if we’re talking about the original PC version), but I couldn’t help falling in love with the iOS port of this PC classic. The vehicular mayhem this app provides totally sets it apart from other racing games, and the frenetic violence and over-the-top characters and settings only serve to make the game a completely original experience. Smashing into pedestrians and other racers never felt so fun, and you will NOT want to tell your psychiatrist about this game. Emily (7 1/2) and her younger sister Claire (5) love to play on the iPad and while their tastes can change on a daily basis, the following are the apps that they kept coming back to throughout the year. Honorable mentions go to The Counting Kingdom which Emily enjoyed (she loves Math), but Claire was still a little young for, and all of PlayDate Digital’s My Little Pony storybook apps as well as Peepo and the Unfinished Story which my daughters both enjoyed…often. Emily (especially) and Claire both loved interacting will all of the crazy residents of Toca Town. They’ve spent countless hours in imaginative play, making up their own stories and discovering all of the hidden content within the app. This one ranks right up their with the best apps that Toca Boca has made and they keep supporting it and adding new content with free updates. If you have younger kids, they will LOVE this one. The third title in the My Playhome series, My PlayHome School adds fun things like a classroom, a science lab a cafeteria and more to this excellent digital paper doll-style series of apps. Every time the girls play with this one I hear lots of giggles. Finally, we have ShipAntics: The Legend of The Kiki Beast, a cute animated adventure /puzzle game for kids. It has cute characters and age-appropriate puzzles that are just the right level of difficulty for kids. Emily had a blast with this one. The only downside I have from a parents perspective about this one is the IAPs. Originally, this was a paid app with just one episode, but since episode two was released, StoryToys made the first episode free, and there is an IAP to unlock the second episode. That would be fine, but there are also bunch of other IAPs for purchasing cosmetic content like outfits. So just make sure that you have IAPs locked down on whatever device your child will be playing on.